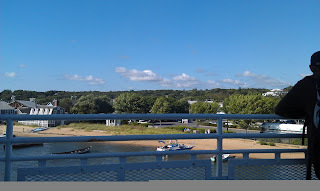 Martha’s Vineyard is larger then one would expect for an Island, but then again, Long Island, NY is 150 miles long. Docking in Vineyard Haven, I’m wondering how far it is to my destination and excited to get out and try my new Garmin 210, first by bike, then by run. If anyone has any running route suggestions while I’m down here, feel free to comment and I’ll give a full review of your route.